BIOS-Recognized for PXE boot on my ASUS M5A99FX-PRO and Gigabyte GA-X99P-SLI boards. Also BIOS-recognized on an old Dell LGA775 motherboard. Full Linux support on Debian 7, 8, Turnkey Linux and OpenMediaVault, running on the above ASUS boards and the old Dell Optiplex board. Card does not work on any Windows machine I have tested, which are the above 3 hardware setups. Currently attempting on a Windows 10 x64 Enterprise machine, but have had the same errors in Server 2012 R2. Oracle says to use the Intel I350-T4 driver (they are the same card), which installs but instead tries to apply itself to my on-board Intel NIC. In the other boards, this driver refuses to install because it does not see an Intel NIC. Extra info: My workstation is on a 2012R2 domain and I'm using a domain admin account with full rights. Have also tried off a domain using local admin. 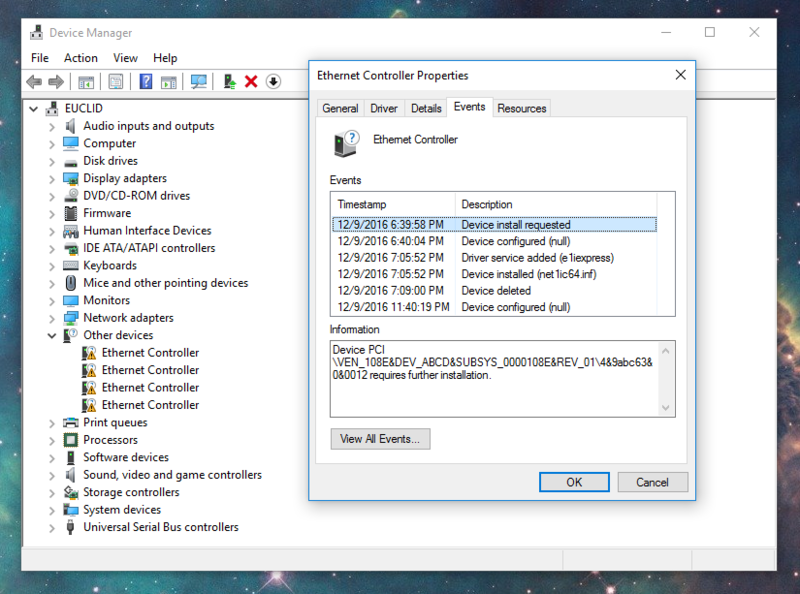 Forcing Windows to use the generic I350 drivers, but device won't power on. Uninstall/reinstall Intel drivers, but this had the same outcome. Intel Driver Detect, but it didn't find anything besides the X99 chipset drivers I'm already using. Pointing it at the driver CAB, which didn't work. 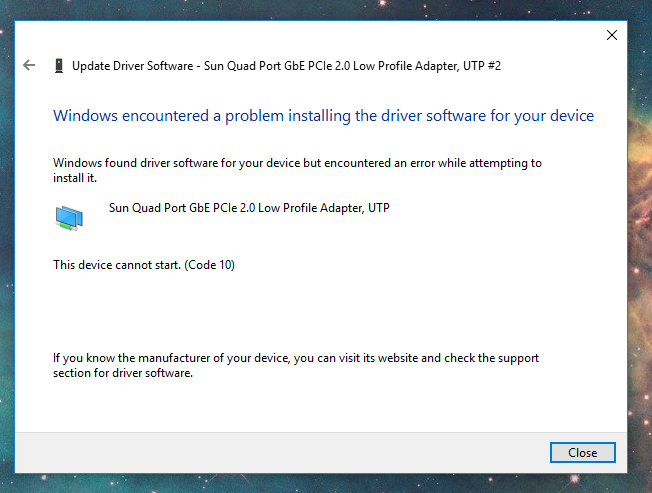 UPDATE: I have also attempted to use the "Sun Quad Port GbE PCIe 2.0 Low Profile Adapter, UTP" drivers listed as generics in Windows under "Intel Corporation." This is the exact model of the card. However, I get another problem, error code 10. See photo. Even though this card reports that it is not working or installed, it is "powered on" because I get both link and speed/duplex lights lit when I connect it to my switch. Any help very much appreciated, as I need to use this card in a dual-boot situation between Debian and Windows 10 on my primary workstation. Browse other questions tagged linux windows networking drivers solaris or ask your own question. Where do I find a working Windows 7 driver for the Intel 82865G graphics chipset?